A New York Times Book Review Editors' Choice. The Sunday Times (U.K.) Classical Music Book of 2018 and one of The Economist's Best Books of 2018. 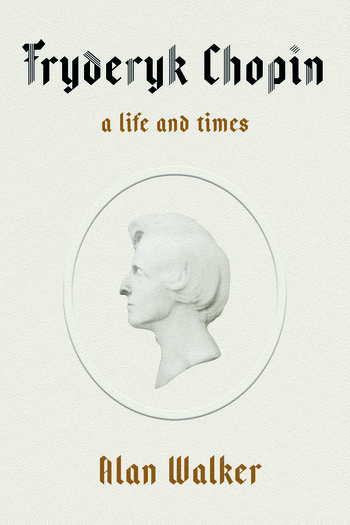 Based on ten years of research and a vast cache of primary sources located in archives in Warsaw, Paris, London, New York, and Washington, D.C., Alan Walker’s monumental Fryderyk Chopin: A Life and Times is the most comprehensive biography of the great Polish composer to appear in English in more than a century. Walker’s work is a corrective biography, intended to dispel the many myths and legends that continue to surround Chopin. Fryderyk Chopin is an intimate look into a dramatic life; of particular focus are Chopin’s childhood and youth in Poland, which are brought into line with the latest scholarly findings, and Chopin’s romantic life with George Sand, with whom he lived for nine years. Comprehensive and engaging, and written in highly readable prose, the biography wears its scholarship lightly: this is a book suited as much for the professional pianist as it is for the casual music lover. Just as he did in his definitive biography of Liszt, Walker illuminates Chopin and his music with unprecedented clarity in this magisterial biography, bringing to life one of the nineteenth century’s most confounding, beloved, and legendary artists. Alan Walker’s definitive three-volume biography of Liszt, Franz Liszt, received the James Tait Black Memorial Prize in Biography and the Royal Philharmonic Society Book Award, among others. His writing has appeared in journals such as The Musical Quarterly, The Times Literary Supplement, and Times Educational Supplement. A professor emeritus at McMaster University, Walker was made a Fellow of the Royal Society of Canada in 1986 and was awarded the Knight’s Cross of the Order of Merit of the Republic of Hungary in 2012.